This item is special order. Please contact us for availability and lead-time. The IOCP-74 is a high performance, user configurable, I/O processing sub-system for PC/104 bus computers. Designed to relieve the host from performing rudimentary I/O operations, it also provides a fast front-end response demanded by many real-time systems. 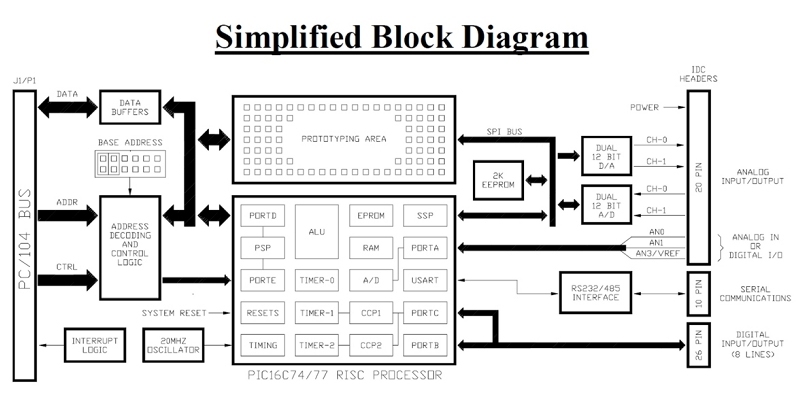 A Microchip RISC processor controls on-board circuitry and executes application specific computations and Logic operations. 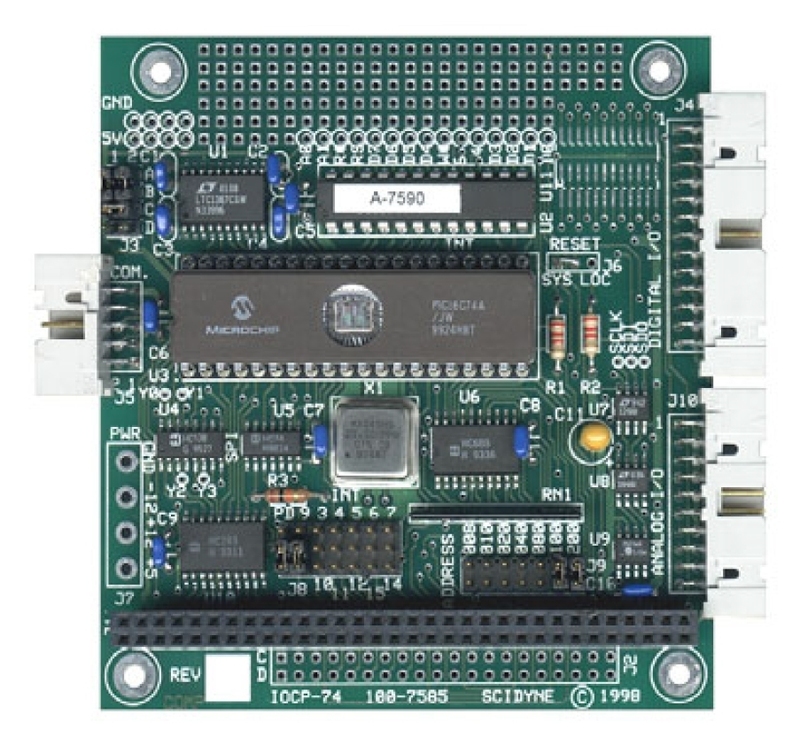 The board is supplied with a PIC16C74A microcontroller but supports several other compatible PIC microcontrollers such as PIC16F877 or PIC18F4520. The IOCP-74 consolidates the most requested peripherals into one module. Standard functions include: Analog and Digital I/O, Counter/Timers, EEPROM and Serial Communications. A user can easily connect additional hardware by means of the prototyping area which accommodates both parallel and SPI type devices in through-hole and surface-mount packages. All module data variables and parameters are stored in a RAM array which the host accesses through a simple 8-bit sequential FIFO interface. This circuitry allows the exchange of relatively large blocks of data even though the IOCP-74 occupys only eight host I/O locations. Further efficiencies are gained by using the module's software generated shared interrupt to request host service only when specific events occur. The IOCP-74 comes with the IOCPbios, a set of assembly language routines and macros which directly control many of the module's core functions. Since most routines have already been developed, custom designs can be realized quickly and with a higher degree of integrity by means of the proven software. To customize the module, a user simply merges the supplied PIC assembly language source code with any special software routines representing the specific application. The resulting code is then compiled and programmed into the microcontroller thus creating the final design. Development effort and costs are greatly reduced by taking advantage of the vast amount of supplemental software, application information and third-party tools available for this very popular family of microcontrollers. LTC1298: Two single-ended or one differential 12-bit (1 in 4096), ±1 LSB, 0-5vdc, 11khz max. PIC A/D: Three single-ended 8-bit (1 in 256), ±1 LSB, Int./Ext. VREF, 5Vdc max. These three inputs can alternately be used as general purpose digital I/O. Eight digital I/O channels, CMOS levels, ±25mA. Pinout and drive compatible with I/O racks and other peripheral devices. Six "PORTB" bits provide software programmable pull-ups and change of state detection. Two "PORTC" bits provide alternate timer functions including Pulse-Width-Modulation, timer clock source and input/output capture/compare modes. PIC supervised serial asynchronous/synchronous communications. Software configured parameters. Supports 9-bit protocols and half-full duplex. Jumper selectable RS-232 or multi-drop RS-485. Non-Isolated. Optionally uses one interrupt, jumper selectable IRQ 3,4,5,6,7,9,(10,11,12,14,15)* or Disable. Software generated, supports sharing. *Access to upper interrupts requires optional J2/P2 stack-through connector. Socketed PIC16C74, 40 Pin DIP, 4K EPROM, 198 bytes RAM On-board 20mhz clock oscillator. Refer to Microchip PIC16C74 data sheet for complete device information. Most user supplied compatible microcontrollers such as PIC16F877 or PIC18F4520 can be substituted but must support the	PIC Parallel-Slave-Port hardware feature. 120+ solder-pad/wire-wrap holes, 0.036" dia. , 0.1" spacing. One 24 SOIC pattern with wire access to pads. Access to: Logic power; PC/104 buffered Data[0:7], Address[0:1], IOR*, IOW*, Resets and 2 decoded I/O selects; Serial Peripheral Interface bus (SDI, SDO, SCLK) and 4 decoded SPI selects. PC/104 compliant, 3.55"W x 3.75"L x 0.6"H. 8-bit stack through.